This post is the last scheduled post in the Accumulator Seriali blog post series for now, but should I find myself with excess time in 2017 I may share some more finds from my personal collections and accumulations. I want to thank you all for following along and leaving me sweet comments throughout the series! The number of angels and Santas in my scrap collection runs in the hundreds. No better occasion to share them with you than today of all days! I hope to see you again next year when I continue blogging about my bookbinding and mixed media projects - Merry Christmas and a happy New Year to each and every one of you! Now it's time for us to listen to the Christmas Peace declaration and enjoy the holidays. A good while ago I realised this series of my personal collections and accumulations could go on nearly forever. And it still could, but it won't. I need to make more room in my schedule for writing my poetry book, so, there will be changes to the blogging schedule after Christmas. I will still be blogging weekly about bookbinding and bi-weekly about my mixed media endeavours. While the Accumulator Seriali series won't be making regular appearances next year, if I get the urge, I might still post a collection every now and then. Today's post is about my childhood collection of Victorian scraps - the only one of my collections I spent years purposefully collecting. The collection is huuuuuge (so there's enough for one more Accumulator Seriali post...), but I honestly have very little idea how huge (well, it's not a museum collection huge by any measure). The last time I remember counting the scraps I finished around 700 (in mid to late 90s), but as I went through the lot it felt like the number now could easily be four times that. But I won't be counting these any time soon. I originally stored all the Victorian scraps in these photo albums with sticky pages (and usually very ugly covers), of which I had about a dozen or so. One day I had the bright idea of finally rearranging the scraps by theme and style, and took them out of their albums, sorted them into big envelopes, and got bored. So, some twenty years later, I have two albums with a few pages of scraps (the other albums have lost their stickiness a long time ago) and many barely together envelopes full of scraps with labels like animals, people, angels, fairytales. Opening up the envelopes unleashed something I had entirely forgotten about - the cursed thing called glitter! Somehow it managed to spread all over our home even though I only had the scraps out for like fifteen minutes. This is obviously the fairytale lot! A lovely jumble of moomins, fairies, elves, clowns. etc. Most of the scraps just look old, but these roses actually are. I can no longer remember where I got them, but it might be from my grandmother. Some scraps are still full sheets - like these ballerinas and fairies. Very girly stuff. I don't remember being a super girly girl, but I wasn't a tomboy either. I sucked at sports (still do!) and I liked pretty things (still do!). More than anything I liked making, collecting, and organising stuff. While many things have changed, those haven't. As an artist vintage photos are a most essential raw material to me. I love the mystery of not knowing who these people in the photos are - it means they can be anyone! I don't make up elaborate back stories to the people who end up in my collages, but somehow I still feel I know something intimate about them and base my work around that feeling. These photos are so much more than pretty faces and drool-worthy dresses. By now my vintage photo collection has grown to a considerable size. Parts of it I have weeded out as photos I'm unlikely to ever use in my work (=put them up for sale at first possible chance - somehow that chance hasn't come in the past couple of years...), parts have been set aside as precious treasures to be used only under some kind of divine inspiration, and the rest is housed in a plastic bin and albums by my desk. The contents of the bin I've sorted according to subject or size. Below you can see some of my tiny photos, measuring just 1"x1½". The ice skaters above and the swimmer girl below are perhaps in my top 5 of favourite photos. They've been waiting for the right idea for a long time already. I'm not sure if it will ever come. I try not to be too precious about my materials, but I can't always help it. Also in my collection: a small handful of glass negatives. At times I know exactly what I should make with these, but I end up second guessing myself before I take the plunge. They need to have light come through to be seen well enough, meaning they need to be either hung at a window or have a light source built inside the collage. The latter option intrigues me, but it's no small job to figure it all out... If I had a ton of glass negatives I'd love to build a divider screen out of them. Not that we'd have room for one in our home, but someone else surely would. Winter is a tiny bit more present than this time last week. November makes me yearn for a proper winter. Winter makes me yearn for spring. Spring makes me yearn for any allergy-free season. But no season makes me yearn for November. Perhaps that's why this month is perfect for either planning ahead or looking back. Today I'm glad to look as far back as these photos go. I made the seller laugh by handing her a big handful of the paper junk everyone else had left behind. I may actually cherish these even more than the actual watch parts and tins! One of these has already been put to good use. Come back on Monday to see where it ended up! While I steered clear from the vintage clothing stalls this time, nothing could keep me from the lace and sewing notions. One of the highlights of my trip to London was the chance to go mudlarking with my friend C - twice, at two very different Thames locations! So, this Accumulator Seriali blog post is also a London - part 1½, in a way. I brought home loads and loads of finds, knowing I'd both use them in my mixed media work and that it's going to be a while before I get to go back to a tidal foreshore filled with treasures. Broken clay pipes, especially bits of their stems, are among the most common finds, but I ended picking up a ton of those "boring" stems as I immediately knew what I'd do with them if only I had a ton at hand (a miniature preview coming on Monday). 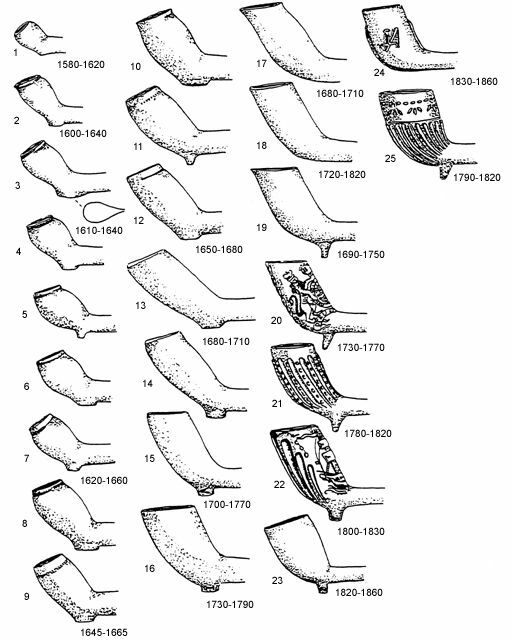 In addition to the stems, I felt really lucky to find an intact pipe bowl by Tate Modern - if this illustration is anything to go by, I think it might be from 1690-1750. Later in the week, while we were at her regular mudlarking spot, C found a decorated piece of pipe and kindly gave it (among many other lovely things) to me - can you see the grapes on the bowl? And that little horizontal heart at the heel of the bottommost stem? The white clay has been beautifully stained by the mud! It was so worth getting up before sunrise to catch the early low tide on Saturday. Both the beach and the river were so calm and quiet. At home I cleaned up the finds, spending a loooong time getting the mud out of the pipe stems so I could get a needle go through. But it's worth it, I hope.